The kitchen shares something in common with the bedroom – it’s where the magic happens! You need a certain level of focus and concentration to make and prepare tasty dishes in the kitchen. 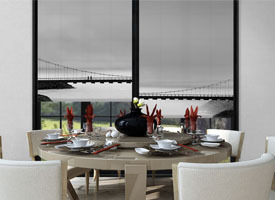 One of the most important ingredients in a good chef’s environment is minimizing distractions, in the home it’s the sun. 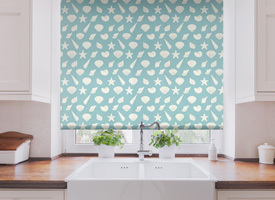 It might shine right to your face at the worst times and you could cause an accident, but with kitchen roller blinds you can prevent this from happening. Kitchen is the room which is really thirsty of ideas. 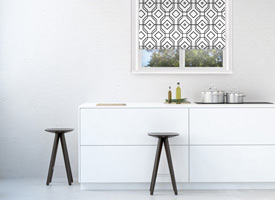 Besides making food, these ideas can be used for kitchen window roller blinds to create a very cozy and inspiring environment which would help you prepare the best meals. 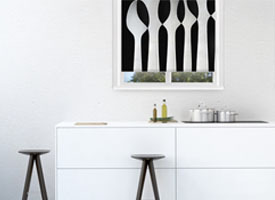 Window coverings and dressings in the kitchen are a welcome addition in any household. 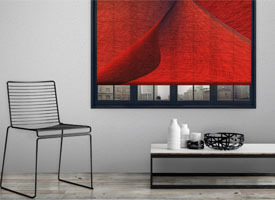 By bringing in colours (such as flashy red or smooth blue), modern ideas transpire through kitchen window treatments and accompanied by subliminal psychological effects of certain colours and patterns, provide a better and nonetheless unique feeling when being in the presence of such decorations. 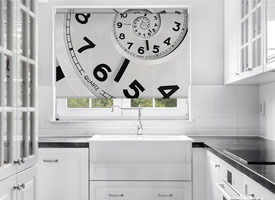 Decoshaker’s collection of personalized roller blinds for kitchen spans way beyond what regular interior decorators and stores can offer. 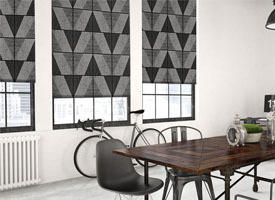 Our window treatments are the best interior blinds for a kitchen that you can find. 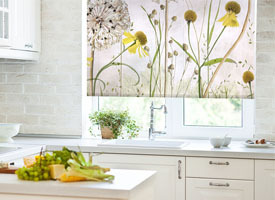 Prices for kitchen roller blinds are competitive and fair. The product range that we offer to all of our customers is exquisite and broad to satisfy each and everyone’s needs and desires. 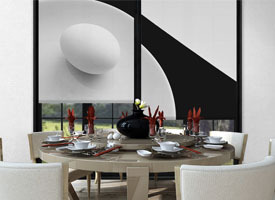 You won’t find better kitchen roller blinds online. Decoshaker is the place to go and be if you’re looking for a way to improve the way: your kitchen looks, you feel in it and what comes out of your time spent in there. 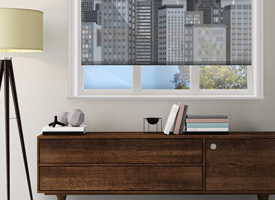 Look at the available breeds and varieties of modern designs to select a patterned set of blinds for those over sink windows or go with a retro look to match the theme going on around the house. The collection is always updated following the latest fashion trends and our experts spend numerous hours working to create and collect ideas from around the web and world in order to make a product so perfectly suited to match your needs. There used to be a time when beauty conflicted with practicality, but those days are in the past and modern goods, especially in décor, can ensure positive emotions and good looks during any day. 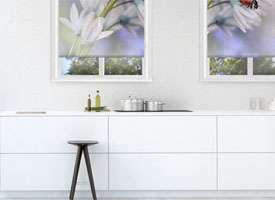 Lot of people wonder what are the “best blinds for a kitchen?”, the answer is that it all depends on your personal preference and other design choices. 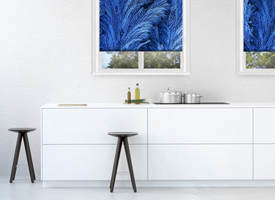 Some people love cold colours, while others need stripes or other accents to fulfill their fantasy of a perfect set of kitchen window roller blinds. The most important thing is that whatever your vision and whatever you are searching for can be found on our website. However, if you cannot find the design which you seem to prefer or if you are having trouble making out which of the designs will fit in with your current or future interior best – contact our team for a tip, suggestion or an answer. 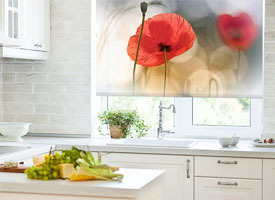 Whatever design you may choose or create by yourselves, make sure that you opt for roller blinds and not a curtain in the kitchen, because that can turn into a very “fiery” disaster. 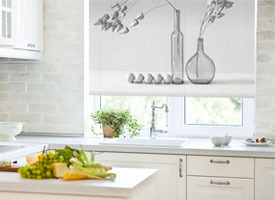 With kitchen windows, sizes are pretty much common and regular throughout the world, however it may very well be that your windows need special sized kitchen window treatments. 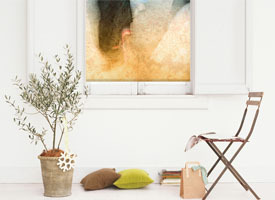 Than you are going to need coverings made just for your windows. 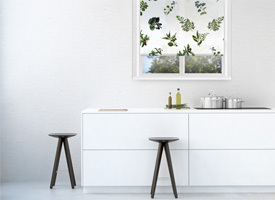 If they possess measurements which could be ranked out of the ordinary, such a possibility is very real and you should be prepared to look for an affordable solution to find an appropriate window dressing for kitchen windows. There could be a need to cover: over the sink kitchen windows, large or small ones, oddly shaped glass and doors. All can be done without breaking a sweat because sizes are fully adjustable on our website. 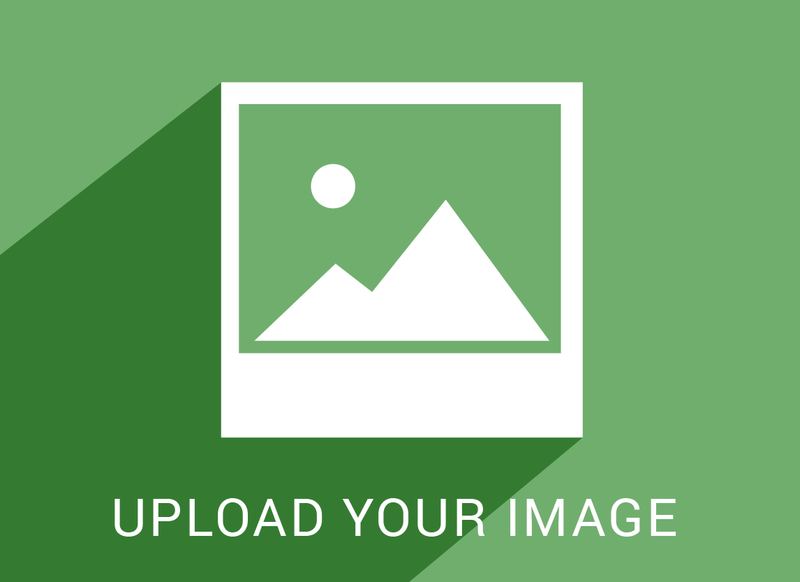 Measure the dimensions of the glass in question and transfer them onto our website. 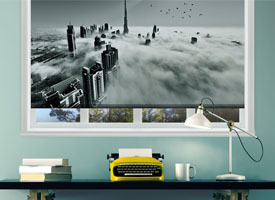 The tool is very simple to use and allows a complete transformation of the canvas to become a reality.